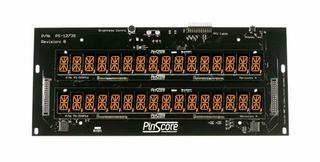 "PINSCORE Display System FUNHOUSE/MACHINE" has been added to your cart. Brilliant design makes brilliant displays. 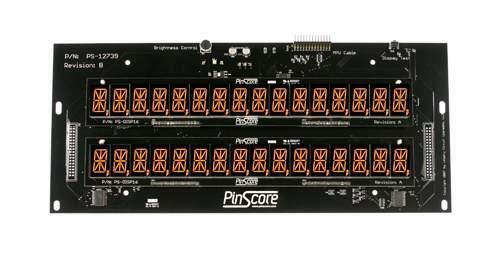 PINSCORE LED displays for pinball machines are the best performing, most feature-packed and economical replacement systems for obsolete glass plasma digital displays. 1. Unplug the AC power from your pinball machine. Remove game backglass and open the backbox insert door. Remove the speaker/display panel and unplug all display boards. Remove the original display and driver boards. 2. Mount the new board. Install the foam light shields around the displays if not already in place. Hand-tighten the screws so you may align the displays with the backglass windows before permanently securing the boards. If further alignment is necessary, adjust the insert panel door hinges and latch in the backbox. 3. Connect the cables. The ribbon cable goes to the connector labeled MPU Cable. The power connectors, J100 and J101, are keyed to prevent incorrect alignment. Ribbon cables are not keyed and it is possible to mis-align the connectors. Observe correct polarity on all ribbon cables - the RED striped wires on all ribbon cables go to PIN #1 (also labeled as Red) on the board. 4. Double-check all connections, plug in the machine, and turn the game on. There are three indicator LED’s to the left of the Brightness Control labeled D1, D2,D3. D1 will flash momentarily upon power-up and D2 and D3 will stay lit indicating that the power supply is working correctly. The PS-DISP16 alphanumeric LED’s will light up. Pressing the diagnostic pushbutton labeled SW1/Display Test on the PS-12739 board will illuminate all segments of all displays. This indicates that all components of the PinScore System are operating correctly. The thumbwheel labeled Brightness Control allows you to set your preferred illumination level.